In this post we will see how can we resolve a very common error while working with SQL Server Data Tools in Visual Studio. The error statement is – “Error SQL70001: This statement is not recognized in this context“. This error occurs in Visual Studio whenever we try to execute some SQL statements which are not DDL in nature. For ex – INSERT, UPDATE statements present in a SQL Script might throw this kind of error. There is a very simple trick to resolve this issue. Let’s see what need to be done. Select the SQL script that is throwing this error. 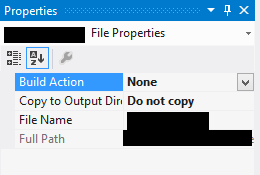 Go to Properties window and change the “Build Action” property for the script from “Build” to “None“. You’re done. Recompile the project without any errors. Hope you like this small tip. Keep learning and sharing! Cheers!